Avascular necrosis of the hip develops when the blood supply to the femoral head is disrupted. Without adequate nourishment, the bone in the head of the femur dies and gradually collapses. As a result, the articular cartilage covering the hip bones also collapses, leading to disabling arthritis. Corticosteroid medicines : Many diseases, such as asthma, rheumatoid arthritis and systemic lupus erythematosus, are treated with steroid medications. Although it is not known exactly why these medications can lead to osteonecrosis, research shows that there is a connection between the disease and long-term steroid use. A osteonecrosis develops in stages. Hip pain is typically the first symptom. This may lead to a dull ache or throbbing pain in the groin or buttock area. As the disease progresses, it will become more difficult to stand and put weight on the affected hip, and moving the hip joint will be painful. How long it takes for the disease to progress through these stages varies from several months to over a year. It is important to diagnose this disease early, because some studies show that early treatment is associated with better outcomes. 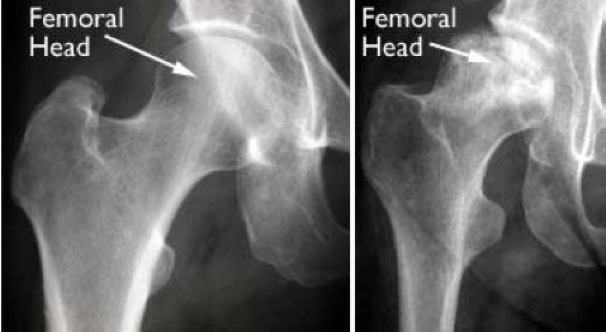 Osteonecrosis can progress from a normal, healthy hip (Stage I) to the collapse of the femoral head (Stage IV). These create pictures of dense structures, like bone. X-rays are used to determine whether the bone in the femoral head has collapsed and to what degree. Early changes in the bone that may not show up in an X-ray can be detected with an MRI scan. These scans are used to evaluate how much of the bone has been affected by the disease. An MRI may show early osteonecrosis that has yet to cause symptoms (for example, whether osteonecrosis is developing in the opposite hip joint). (Left) An X-ray of a healthy hip joint. (Right) An X-ray, where osteonecrosis has progressed to collapse of the femoral head.